Eight types of woodpecker call the Peach State home, although a ninth possibly still exists. While most woodpeckers live in the state year round, some "snowbirds" arrive to take advantage of Georgia's relatively mild winters, heading north in the spring. Woodpeckers inhabit a variety of habitats. If you don't actually see these birds, you'll know of their presence by their constant rhythmic pecking of wood. The red-headed woodpecker (Melanerpes erythrocephalus) is among the most common woodpecker species in Georgia. Easily recognized by his red head and neck, this bird sports a black and white breast, black tail and a predominately white underbelly. The red-headed woodpecker prefers open areas over woods. Like other woodpeckers who live in temperate Georgia year round, the red-headed woodpecker might produce more than one brood annually, each consisting of four to five chicks. Breeding season ranges from late March until July. Both parents care for the chicks. The red-bellied woodpecker (Melanerpes carolinus) also has a red head, along with black and white wings. Despite the name, most of this woodpecker's belly is pale gray, with just a small amount of red coloration near the bottom. These birds live in hardwood forests, preferring large trees. Like other woodpeckers, they consume insects, seeds and fruits. The downy woodpecker (Picoides pubescens), the smallest woodpecker in North America, lives among many types of trees. If you see woodpeckers at your bird feeder, they're most likely this species, as they aren't as shy as other woodpeckers and often dwell in suburban areas. These short-billed birds are black and white. You can distinguish male from female as the male has a small red patch on the back of his head. The hairy woodpecker (Picoides villosus) looks just like his downy cousin, but is somewhat larger and has a longer bill. The yellow-bellied sapsucker (Sphyrapicus varius) has a red forehead and a yellowish breast that turns white near the bird's vent. This medium-sized black and white woodpecker isn't a year-round resident, but spends the winters in both Georgia forests and open lands. Named for a primary food source, the sap of trees in which they drill holes, sapsuckers also consume insects like other woodpecker species. The pileated woodpecker (Dryocopus pileatus) boasts a large red crest on his head. While his throat is white, the rest of this long-billed bird's body is black. 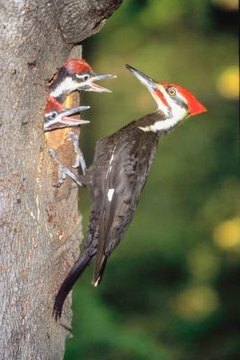 Pileated woodpeckers live in pine or deciduous forests near water sources. Comparable in size to a crow, the pileated woodpecker is heard more often than seen, as it's a secretive type of bird. Their constant pecking in dead trees or logs creates nesting space for other species, including bats and owls. The northern flicker (Colaptes auratus) is easily identified by his yellow under wings and tail. There's a red spot on the back of the neck, underneath his gray head. Male northern flickers have black "mustaches." These birds dwell in forests containing dead tree stands, where they nest. They're also found around agricultural fields and forest edges. In Georgia, the red-cockaded and the ivory-billed woodpecker are considered endangered species. Despite his name, the red-cockaded woodpecker (Picoides borealis) is black and white. Grown males sport a small red spot at the back of their white heads. Maturing at approximately 7.25 inches, this woodpecker's cheeks are entirely white, making the species easy to distinguish from other black and white woodpeckers. While sightings of the ivory-billed woodpecker (Campephilus principalis) are occasionally made, there is no concrete evidence that this truly rara avis still exists.